As a guest at the Bay View Resort, you have the gorgeous white sandy beaches, boardwalk fun and great onsite amenities. But, if you are looking to heat up the competition with the family, look no further than a game of laser tag. Suit up and get ready to glow as you eliminate the competition for a title of lost survivor. Check out the several locations that you can choose from to begin battle. ULTRAZONE Extreme Laser Tag – Located just off Restaurant Row on the north end of Myrtle Beach, this facility features state-of-the-art laser tag equipment and a space-outpost-themed battle arena with multiple levels. Aglow with black light-boosted neon imagery, the arena is home to a trio of base areas, allowing three separate teams to do battle at once. An attached arcade offers both newer and retro video games for the gamers in your group to enjoy. With special party packages offered, this is also a great place for celebrating birthdays and staging team-building corporate outings. 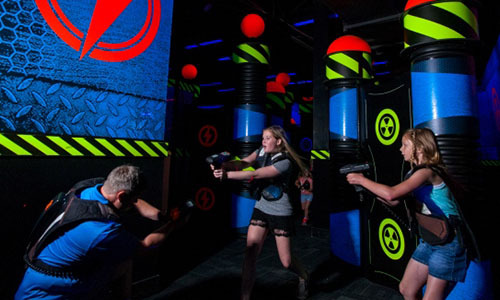 For more information, visit http://www.myrtlebeachultrazone.com Fun Warehouse – Located off Highway 17 on the south end of Myrtle Beach, this family entertainment hot spot boasts a two-story Urban Quest Laser Tag Arena that covers a total of 3,500 square feet. Your mission in the game is to snuff out a possible uprising in the chaotic Industrial District, and along the way you’ll encounter 3D props such as fallen steel beams, huge metal gears and oversized bolts, riveted metal walls with broken sections and torn edging, and stacked crates and barrels that hinder your progress through the urban maze. Flashing lights and neon airbrushed artwork add to the sense of impending mayhem. If your crew is hungry for more action after the laser-tag battle has been won, Fun Warehouse offers a 50-plus-game arcade with the latest releases and throwback carnival-style games, a roller-skating rink, the Thundervolt Raceway elevated go-cart track, and an area dedicated to inflatable slides and bounce houses. To learn more about all the attractions, visit funwarehousemb.com. Surf's Up – Located off Highway 501 near the Tanger Outlets east of Myrtle Beach, Surf’s Up features a laser-tag arena where smoke fills the air and excitement runs wild. As players scatter through the corridors and along the ramps of the arena’s dark labyrinth in an effort to claim the title of laser-tag champ, spectators can follow the action from the lobby with the help of LCD monitors and scoreboards. Other fun attractions at Surf’s Up include an arcade featuring more than 60 games, a 24-foot rock-climbing wall with four separate climber stations, and a pizza/pasta/salad buffet for when all the action gets the troops hungry. To learn more, visit http://www.myrtlebeachlasertag.com . Whether you’re looking for laser-fueled action or just a place to kick back and relax on the beach, Bay View Resort on the oceanfront in can deliver the perfect getaway. Book your vacation today, and start preparing for a getaway on the South Carolina coast that your family will remember for years to come.